You'll be £14.99 closer to your next £10.00 credit when you purchase The Pug Who Bit Napoleon. What's this? From elaborate Victorian cat funerals to a Regency era pony who took a ride in a hot air balloon, Mimi Matthews shares some of the quirkiest—and most poignant—animal tales of the eighteenth and nineteenth centuries. ★★★★ Adorable animal stories, perfect for any animal lover. This is a fun, quick read, and also very interesting. rom elaborate Victorian cat funerals to a Regency-era pony who took a ride in a hot air balloon, Matthews shares some of the quirkiest and most poignant animal tales of the eighteenth and nineteenth centuries. And who knew that a dog disrupted Napoleon’s wedding night! Based on eighteenth and nineteenth century books, letters, journals, and newspapers, these animal tales, sometimes humorous, sometimes heartbreaking, provide a fascinating read for animal lovers of all ages. Enhanced with colour illustrations, this is delightful book to dip into! 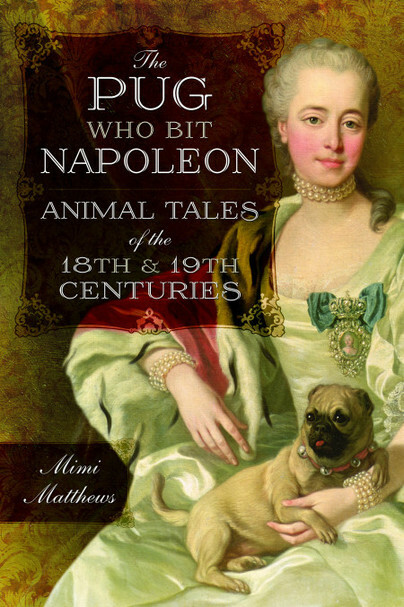 The Pug Who Bit Napoleon is a fine collection of animal stories from the 18th and 19th centuries and they make very entertaining reading. But the outstanding thing about this book is the wealth of excellent colour illustrations, from Mr Agasse’ study of a red fox or Orlando Hodgson’s drawing of the maiden lady with her extraordinary collection of pets - something which was far from rare, cats being a particular favourite (I recall that in old age Florence Maybrick surrounded herself with cats.) After reading some heavy titles of late, it was a delight to settle down one chilly afternoon in a warm room and relax with this exceedingly well-written collection of animal tales. Amazing book! As always with Ms Matthews you are engrossed, it's educational and fun and for those that love their history and the history of animals then this is the book to read. To me it's flawless!! once saved his life. Pope memorialized that dog in poetry; Lord Byron did the same for his beloved dog. The stories themselves were generally interesting, more so when the owner was somebody well-known. There are many other heartwarming or quirky stories in this wide-ranging book, and every reader is sure to find some surprises here. They will also find the author's own sympathetic and sometimes humorous reflections — and, once they have finished the last chapter, endnotes and a bibliography to help them follow up their particular interests. The Pug Who Bit Napoleon is due to be published at the end of November this year (2017). But beware: those who buy it as a Christmas gift may feel quite unable to part with it! I enjoyed this book a lot and found the author's informal style both accessible and fun to read. Presents history in a lighthearted and interesting way. The author, Mimi Matthews, takes the reader on a historical tour of famous people who owned dogs, cats, birds and other assorted pets. The book is a quick, fun read. I'd recommend this enjoyable book to fans of animal stories. A rather unique look at an area of history I like to read about. This book is so wonderful and a must-read for any pet and history lovers! Honestly this book had me at first glance - my favorite historical figure AND my favorite dog breed, how could this possibly go wrong? And each of the entries and profiles was more charming than the last. The Homeric dedication of Lord Byron to his dearly departed Boatswain and the rumors of Emily Brontë's bulldog being her witch familiar & being the first in line in her funeral procession were my two favorite anecdotes, but truly the entire work is a gift. One of the most delightful historical books I've read in awhile. As an animal lover and a history buff, this book was quite fun to read. I read it in one sitting and I feel that many will do that. The pace is perfect and it's just really full of fascinating facts.